Five fast, fun, focused, and informative videos. One video to help you better understand the DISC model and four application tips videos. One video for each of the four DISC styles. The Working with Different People Without Annoying Them and Frustrating You special report (PDF version). We believe our work isn’t done until you are completely satisfied with the results you have received from our training. When you choose to learn with us, we have built satisfaction guarantees to ensure your happiness (or delight) with us, our work, and most importantly, your results. Every product is backed with our guarantee of complete satisfaction. 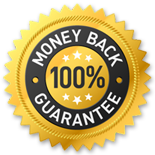 If, for any reason you aren’t 100% satisfied with your purchase, you can get a full refund. No questions asked. Guaranteed. Yes! I Want Instant Access To The Videos Now! Overcome the challenges I face when working with people who are different from me.